Ninos Youkhana | My thoughts…My life…. * My final good-bye email to my friends and co-workers at the U.S. Embassy in Baghdad. You’re busy. Let me get right to it. Wednesday March 7 will be my last day at the office. I’m writing this email with a schizophrenic feeling. It feels like I’m divorcing someone I love. My mind is numb, and my heart full of trepidation from uncertainty, a difficult presentiment to express with adjectives. It has been more than six years and four months since that call. It was around 7:15 on a below zero Monday morning in December 2011. I was on the Red Line train going to work in Downtown Chicago when I got a call – a call that would change my life. I was a senior programmer for Accenture Corp. working on cutting edge processes for the health care system of America. On the other end of the phone someone was offering me a job at one of the front lines of American foreign policy – the U.S. Embassy in Baghdad. But with one caveat, if I accepted it I had to leave the next day. With 30 seconds to make a life changing decision, I decided to embark on a risky adventure. I arrived at work, cleaned out my desk, and submitted my resignation. 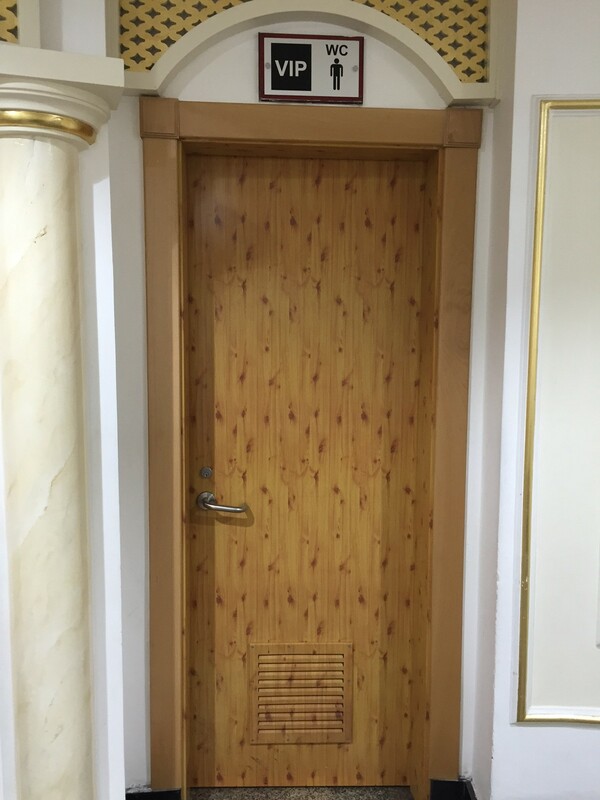 After six Christmases and six New Year’s Eves living a sequestered life between T-walls, ensconced in my palatial CHU (compartmentalized housing unit with handbook), rusticating in the BDSC wilderness, I have arrived at the finish line of my tour de Irak. To resign and bounce back from such a prestigious job and go back to the unknown that’s awaiting in America, to go from somebody to nobody, is scary. Thinking about the finitude of my life kept me questioning how many years I should stay here. I’ve spent my 30s in Iraq, and with every day of my 40s that passes, it is becoming increasingly important to spend my life among my Assyrian community, my relatives, and my aging parents. There is no mathematical formula to calculate these types of sacrifices. However, I’ve learned a lot during all these years in Iraq. I’ve become an autodidact, read more than 300 books and travelled to many countries. As well as started to blog about my personal thoughts and life at www.Ninos.Blog, and to share my political and cultural views at www.CoffeeShopPolitics.com , and wrote an introduction for (maybe one day in the future) my book, “The Longest Bridge”. But the greatest skills I have acquired are people skills. I met a lot of people with different nationalities, backgrounds, personalities, and characters. Some, I keep in touch with. Others, I forgot them the moment we parted ways. Only a few made me scratch my head and wonder how America ever became great with these people working in it. Having survived the entire duration of my employment without being culled with a sickle from the workplace, because I’ve rubbed someone the wrong way, disturbed the ingratiating dynamic, said something wrong, or just for being unlikeable, I consider one of the greatest successes in my professional career. In thorny reality, we don’t own our reputation. If we speak to 25 people, we will have 25 reputations. Thus, managing co-worker relationships, massaging egos, maneuvering between difficult characters, is a priceless skill. I consider myself graduated from the Harvard of Relationship Management. As I’m writing these lines, I remember Seneca’s 2000 year old wisdom. He said, “We suffer more often in imagination than in reality.” As I passed the age of 40, the uncertainty of finding the next job, and leaving a semi-secure income with a feeling of false stability is a risk I never thought I would face. But to grow in life, we must face our fear. I’ve decided to face my fear. It’s March 2018 I haven’t received a phone call for another job opportunity. But just like the stress of the weights build my muscles at the gym, the stress of the unknown will help me re-invent myself. A few years left in my 40s, and I look forward to the coming years and what they may teach me as I write the next chapter of my life. The Iraqi culture taught me to leave a redolent fragrance when I leave a place, and I believe I have done just that. Thank you SSI. Thank you RSO office. Thank U.S. Embassy Baghdad. Good luck with the mission! Have you heard about the anti-library? I have one. I regret not starting to read at an earlier age. I just didn’t know better. Now, when I see a kid sitting outside reading, I envy her. As the end of 2017 is just around the corner, it has been my tradition since 2014 to recommend one book out of all the books I read since the beginning of the year. As of the writing of this post, I’ve read 36 books. And I’m in the middle of reading six more: “Twelve Against the Gods” by William Bolitho, “Culture and Imperialism” by Edward Said, “Science in the Soul” by Richard Dawkins, “Stein on Writing” by Sol Stein, “Jesus: A Biography, from a Believer” by Paul Johnson, “The Daily Stoic” by Ryan Holiday. I have seven new books on my Kindle, eleven sample books, and my Amazon Wish List is reaching 600 and counting. Oh and “Skin in the Game” by Nassim Nicholas Taleb is on a pre-order for delivery on February 27, 2018. While all these are on my plate, I keep asking my friends if they read, “What Happened” by Hillary Clinton, and “Hacks: The Inside Story of the Break-ins and Breakdowns That Put Donald Trump in the White House” by Donna Brazile. Nassim Taleb calls this collection of unread books an anti-library, read books are far less valuable than unread books. My anti-library is not for ego-boosting. In fact, it’s not cool. I trudge around stressing about catching up on my reading. Time is slipping away and knowledge is passing me by. It’s frustrating. It’s frustrating, because like I said last year: what to read? What to focus on? And how can you decide? – if every second something interesting gets published. Selecting one book for public recommendation, out of the myriad of choices, is difficult, because our reading experience and interests are subjective. What fascinates me might be downright boring to my friends, let alone the public. I believe a great book is the one that connects the content to our own experience. It makes you shout “Yes…this is how I felt.”, “This is what I mean!” – It validates us. And, I don’t mean that in the sense of “Confirmation Bias”, where we find extra evidence for our points of view. Rather, it does so by completing a puzzle in our own mind. As if we had known for some time that something was true, but we couldn’t see the finished picture. The author rearranges the words that we have been trying to sort through, and everything comes into focus, making our thoughts more orderly, and our mind more structured. I consider Trump’s winning of the U.S. election in 2016 as one the most important events in US presidential history. It left half of America dumbfounded. The political statistician who was named one of The World’s 100 Most Influential People by Time magazine, Nate Silver, was left flogging himself and wailing at his odds and polls, and the Clinton and Bush dynasties charred wrecks on the side of the road. Understanding the reasons behind that victory is vital for all Americans, especially after causing the country to be increasingly and bitterly divided. 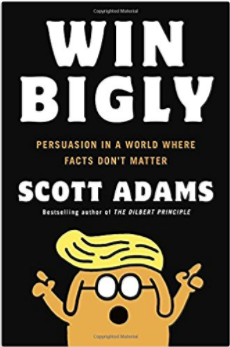 Thus, my 2017 book recommendation is: Win Bigly: Persuasion in a World Where Facts Don’t Matter by Scott Adams. Now, let me tell you how I discovered this book. While I was working out, I glanced at the TV, which was on CNN and saw the cover of the book. Based on the cover and news channel, I assumed that the book would be mocking President Donald Trump. Plus, I didn’t know who the author was until I came closer to the TV to see it – Scott Adams (the creator of the Dilbert comic strip). Without reading the reviews on Amazon (which I rarely do), I bought the book as soon as I got home. The moment I started to read it, I was hooked. It turned out that Scott Adams is an Ultra-Left who wrote an unbiased book explaining his version of why President Trump won the presidential election. I did vote for Trump, but I predicted Hillary’s win, as you can see from my Facebook post below, from October 2016. In my “What is Political Prostitution?” blog post written around the same time, I explained why I would have voted for Trump either way, even if he ran on a Democratic ticket. Back to the book recommendations. If I were to pick the first and second runners up, they would be “Overthrow” by Stephen Ninzer and “The Prisoner in His Palace” by Will Bardenwerper. Also, “The Taliban Shuffle” by Kim Barker is great, “The Clash of Civilizations” by Samuel Huntington is fascinating, “Born a Crime” by Trevor Noah is amazing, “Weapons of Math Destruction” by Cathy O’Neil is thought provoking. Finally, if you are interested to see the complete list, everything I read is pinned on Pinterest 2017 Books board. For 2016 recommendations, 14,997 Pages and One Book. For 2015 recommendations, 300,000 Pages and one book, where I also explained how I select the books I read. For 2014 recommendations, 400,000 Pages in Baghdad, where I also I wrote about the ugly side of reading 100 books. In Happiness from Lalastan, I wrote about how the Privileged Rich West seems to live in a bubble of their imagination and the stupidity of certain claims about Happiness. In Life Goal of Reading 10,000 Books, I explained the reason for trying to cross the Rubicon of my cognitive limits. P.S.2: If you enjoyed the story, please follow from upper right corner to have the next story delivered to your inbox. My seven-city tour was coming to an end. I had visited Dubai, New York, Toronto, San Jose and Phoenix, over the course of a month. I had three days left before returning to my job in Baghdad. Just enough time to get married… or anyway, my aunt seems to think so. I’ve never written about my dating escapades, but this seems like a good place to start. Many of my family live in the Chicago area, and that’s where I was, just relaxing for a few days before going back. That’s when my aunt decided to start arranging my marriage. She didn’t actually think I had enough time to get married of course. But to meet my future wife and begin our courtship? Definitely enough time for that. What time does it take? You make a phone call, you meet for coffee and you start the courtship. I gave in and agreed to initiate a dialogue with her. Less than half an hour later, I was sitting in the kitchen checking something on my iPhone when my aunt came walking down the hall at a brisk pace, holding a small piece of paper in her hand. “I got her number!” she announced, sounding and seeming like the New York Times was running the headline “Elon Musk lands on Mars” I couldn’t help but smile at her excitement. In the Middle Eastern culture, if a woman has been sexually involved with someone, she would be considered tainted, and no man would want her. Vaunting virginity like a badge of honor is common practice in the culture of shame. So anyway, I messaged her. I’m thinking to myself: “Thank God, finally!” Now, at least I know my picture wasn’t the reason for her late response. After a few more silly text messages between us, I asked for her Facebook. I was itching to see what she looked like. She replied: “Facebook is only for family and friends.” That’s fair enough, I thought. When she answered “No.” I thought “Hmm…well that is interesting” (keep in mind, I’m not asking for Instagram or Snapchat). Suaving my way along with more silly text messages, I wished her a good night and ended the conversation. I started to think to myself: born in Chicago, age 33, and no LinkedIn. She is neither a lawyer nor a doctor. Not even a pharmacist… or business owner. I would’ve known all that because my aunt would’ve known all that. And there are very few female doctors, lawyers, pharmacist, or business owners in the Assyrian community. So, everybody would know them. As an educated Assyrian guy who is interested in meeting an educated Assyrian woman, her not having a LinkedIn account was a red flag for me. In my opinion, at the present time with social media, a LinkedIn profile speaks volumes about a person. It’s a professional representation of oneself to the outside world. And not having one means you don’t feel comfortable enough with yourself to present a picture to the public. Or, more importantly, you might not be an accomplished person. I decided not to pursue this girl. As Christian Assyrians migrate – from the Biblical lands of the Middle East where Islamic cultural hegemony is the modus operandi, to the Liberal and Progressive American land where Steve Jobs has been extolled to Sainthood, and the iPhone replaced the symbol of the Cross – we Assyrians exist in a state of cultural schizophrenia, losing our ancient customs in this social re-evaluation. The attitude of self-promotion via vaunting virginity is still common in the Assyrian sub-culture in America. I have dated more than a few women who empowered themselves with considerable status using that very technique. Now by all means, I could be wrong about this girl. I could be having a Don Quixote moment. She might not be interested in meeting me after seeing my picture, and possibly she is educated. Perhaps too, she is not a virgin, and so she has sworn off the idea of dating an Assyrian man. Virginity is a cultural value of that old modus operandi designated to women by men, like a proprietary gauntlet around their sexual behavior. With that in mind, what is the fastest way to cheapen a woman? It is to remove that value. What I found even more interesting is when I meet women who are virgins (I met quite a few) passing judgment on other women for “whoring” themselves by having a few relationships. Then the conversation shifts into another debate on the topic, “What is the cut-off number of relationships a woman could have before she is considered a ‘whore’?” One? And what? Am I supposed to believe that virginity is as important as a LinkedIn profile? I know what’s important in today’s world. But what the hell is my big beef with virginity? Look, I’m not being iconoclastic by rubbing the Assyrian culture’s nose in the mud. (or am I?) What I am talking about here is the evolution of old world cultures after a new generation arrives in America. My father dated only my mother, I on the other hand, have dated many girls. Each generation pushes the process of assimilation further on towards the Liberal horizon. Stop and think for a few seconds. We are in the 21st century. As humans, we are at the edge of evolution from Homo Sapiens to Homo Deus. Here I am, a guy who lives in Chicago, a major American Cosmopolitan city being maneuvered into a fixed marriage, and at the same time deeply engaged in my own philosophical debate on the value of virginity vs. a LinkedIn profile. My episode represents a close-up view of a transformation in the Assyrian cultural scene. I find it to be hilarious. The old mentality in the Assyrian community is so impressed by the moral principle of virginity that other values get forgotten or overlooked. Things such as education (never reads), character (always negative), a potential for growth (lazy), lifelong learning (careless about self-improvement), financial responsibility (mountain of credit card debt), and physical fitness (gym is a tourist attraction). Did I mention that one of the four finalists competing to colonize Mars is an Iraqi woman? Look how far did she’s willing to go to escape her cultural requirement for virginity. I bet she has a LinkedIn profile. I should be dating an astronaut. Have you supported a cause on Facebook? Let’s say: health care, gun rights, your friend’s new book, or your friend who’s running for an office. Raising awareness to support those causes is common on social media sites like Facebook. Users are very familiar with ads, videos, and posters of that nature. But let me ask you this, have you been on the other side of the table trying to gather support? Like, running for an office? Promoting anti-deportation? Promoting your book? I’ve been on the other side of the table. It feels disappointingly ugly. Many people would support on social media, but when it comes to action. Nothing…no action, unless you consider clicking “like” or “share” as sufficient action to have an influence on an issue. Many friends would click on like and share your post, but just a few would buy your book. And if you run for office, many would do the same on social media, but just a few would go to vote. This phenomenon got me thinking. 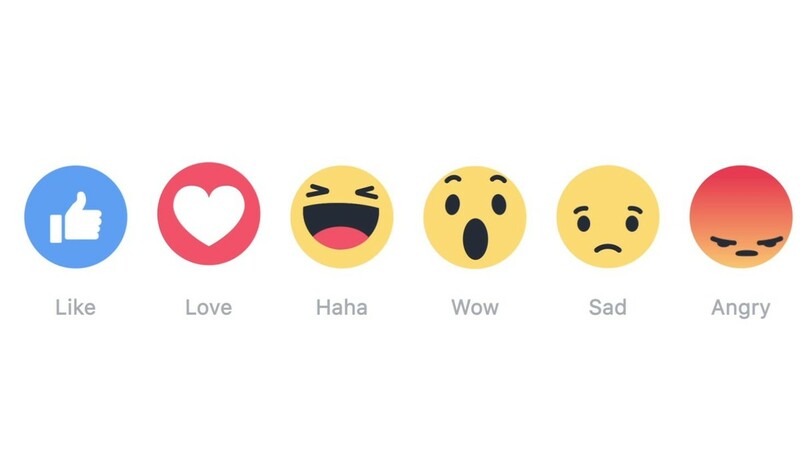 So what happens when Facebook users click one of those emotional buttons: like, love, haha, wow, sad, or angry on our post? It’s the user’s emotional state of mind transported, via the gift of Facebook, and grafting it onto our mind. Our brain accepts it. Because it cannot distinguish Facebook like from a real like, it is misleading. Guys get into this trap a lot. When a girl clicks like on a guy’s picture, the guy would think she likes him – No dude…She likes your picture…Not you! In my judgment, they have become a digital dumb down unit of scale for support. Don’t get me wrong. I’m not against using Facebook to raise awareness for support. It is the perfect platform for that. But I’m concerned that it has become a replacement for the real support that matters more in real life. Let me stop my harangue and give a real life example of what recently happened to the Iraqi Chaldean community in Michigan. On June 11, 2017, ICE raided and detained 114 Christians in a surprise raid to deport them back to Iraq. It’s the first time in the U.S. history. Usually, it’s the other way around; Iraqi Christians flee Iraq to come to America, not this time. As I am sitting in Baghdad halfway across the world from Detroit, I cannot stop thinking about what is happening to our people there. For the ten days following, many Chaldeans kept sharing updates, raising social support, posting, tagging, and streaming live videos urging the community to stand united against the deportation on Facebook. It was a very successful Facebook campaign. It captured the mood of the community. It was a highly publicized issue, even major news organizations like the Washington Post, the New York Times, and CNN covered the issue. According to community leader Wisam Naoum, it is estimated there are 120,000 Chaldean people living in Michigan alone. There was free transportation provided for those who wanted to participate in the demonstration. I don’t like to be calculatedly pessimistic, but I did the math. About 400 people were transported via the free transportation. I checked the videos and asked a few friends who were close to the scene. I took the average between the overstated and understated number given to me and filtered out other nationalities and ethnicities like the Latinos, African American, and Muslim Iraqis. I put the number of Chaldeans who participated in the rally at 500. That is 0.41% – less than a half percent. Let us pause and put this in perspective: Here is the Iraqi Christian community facing a historic day, and what do you get? Less than half of one percent of the population. It leads the outsider to only one conclusion: that the community supports the deportation. And what happened to all those Facebook likes, comments, and shares? It was a public social catharsis. That is all. This has have become the minimum type of support expected, a replacement for the real tangible support, just a remedial for our psychic wounds. In real life, we call it lip service. I’m not sure, but it seems Facebook ushered in a new age, the age of the perception of support mattering most, an age where real support has become absent. The physical world and the virtual world coexist in that they complement each other. But, just like faith without good deeds is dead, showing virtual support is dead without physical deeds. Nothing beats the real thing…like going to vote, marching in solidarity, or buying your friend’s new book. My concerns are genuine for our people. A political issue like deportation on this scale for our Chaldeans is a calamity. It is striking, in retrospect that the Facebook campaign plus the national news coverage resulted in a little number of demonstrators. WE, as a modern society are using the easy way out sometimes – by clicking like – to fool ourselves into believing we are involved. The virtual participation thus bequeathed a little number of demonstrators to proof beyond comments, and likes. I might be wrong, but in the long run who isn’t? In August, I plan to visit the Assyrian Food Festival in San Jose for the first time. 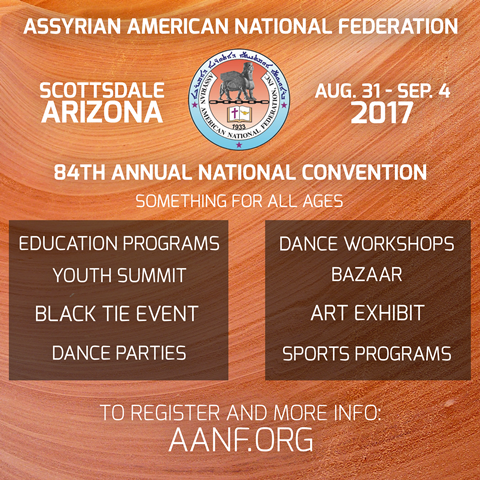 I’ll also be attending the 84th annual Assyrian American National Federation (AANF), commonly known as the Assyrian Convention, in Scottsdale, Arizona. Coincidentally, my 41st birthday, which is fast approaching, happens during the convention which makes it more special. If you are one of those Assyrians who feel like that about AANF, I understand. But as I write this post, I cannot stop thinking about a theory commonly called “Tin Disease.” During the harsh winter of 1812, Napoleon invaded Russia with 600,000 men. He returned to France with 10,000 men, losing 98% of his troops. According to this theory, the main cause of death of all those men was not really the cold: it was a button – a uniform button made of tin. Because in very cold weather, Tin buttons would disintegrate and turn to dust. Napoleon’s Army couldn’t keep their jackets closed and majority died from hypothermia. Historians and chemists alike, enjoy telling this story to explain, not only the failed military invasion, but the eventual collapse of Napoleon’s empire. 2,000 attendees represents approximately 0.5% of the entire Assyrian population in America. Wikipedia estimates there are 400,000 Assyrians living in the which means that 1 in every 200 Assyrians living in the US, attend the conference. In my opinion, this low level of attendance shows the lack of desire for Assyrians to connect which I view as lamentable. The number of annual attendees should arguably increase, especially after the 2003 American liberation of Iraq, when thousands of Assyrians migrated to the US. I hope that by my 57th birthday in 2033, which will be the same year as the Centennial Anniversary of the AANF, that attendance reaches 10,000. But to be fair, AANF is not solely to blame. I do not intend this blog post to highlight AANF as an organization: I wanted to emphasize the Assyrians who create history, with AANF as the venue to discuss, appreciate and document the history of our lives. Just know that all our stories in AANF are part of us now. And that they are bigger than us. They will always be. Assyrians represent the unification of the ancient and the future at the Assyrian convention. It is a romantic idea. Romance, after all, is a nostalgic form of our history. Every time I attend the convention, I feel I’m part of a legacy – an ancient and deep-rooted legacy. As Europe went through World War I, Assyrians in America formed the AANF. Along with it, the Annual Assyrian Convention tradition was born…to tell our story…stories that connect us, those are our chemical molecules. Those are endorphin of our brain, the interwoven relationship between chemistry and history comes alive at the conventions. That is why I love the AANF mission, vision, and value. I support it. Because of the decreased interest in attendance, future Centennial Anniversaries of AANF appears to be the opposite of the grandeur of ancient Assyria. So do not listen to your inner voice when it tells you not to attend. I invite you to come and perform countless acts of kindness for other Assyrians in exchange for a new story. In this post, rather than speculating on the reasons for the Facebook comments above, or get involved in nuisance arguments with others, I’d rather talk about the positive molecules of our lives. I want to shape the process of thought by supplying the substance of thoughts. So despite all the negativity surrounding the Assyrian convention, I’m here to tell you – it’s okay. Just come. Even if you don’t have a group, a girlfriend, or a boyfriend to come with, it’s okay. I am going, because I want to be connected. So you should too! Let the endorphin’s reaction of our connection be caused of our unity. The aromatic molecules from our stories are abundant. We will have something to talk about. See you at the convention, or maybe earlier at the Assyrian Food Festival, stop me… I’ll smile very serenely and say, nice to meet you. That is our future. P.S. 1. I am not a member or a volunteer for AANF. I did not get paid to write this. P.S. 2. Last year and this year I’m staying at Embassy Suites by Hilton Scottsdale Resort last year. A seven-minute walk from the convention hotel. P.S. 3. If you enjoyed this story, share it please. 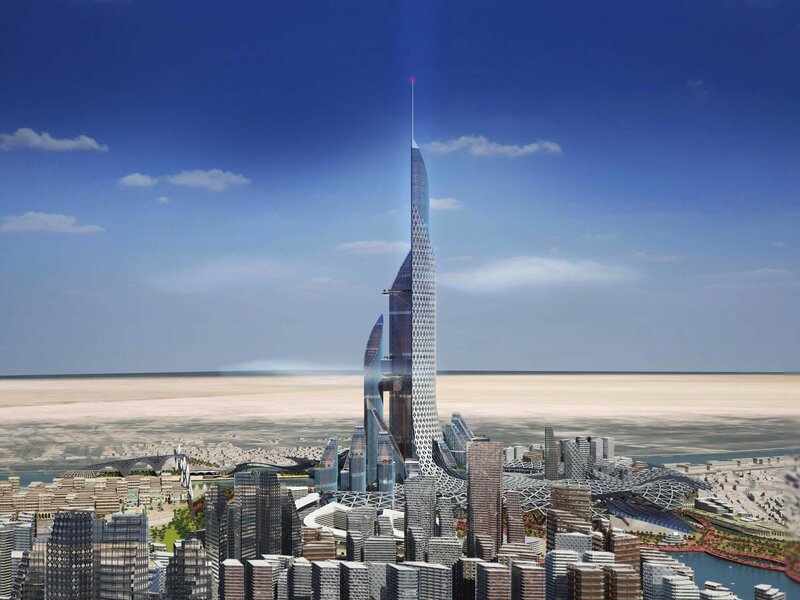 The world’s tallest building is in Dubai – but not for long. Because in Basra, Iraq “The Bride” – a 604 story building – will soon rise, according to Business Insider. Because I’ve been working in Iraq for a few years, friends and acquaintances always ask me about business opportunities in Iraq. Questions like: what are the best industries? What could I invest in? What does Iraq need? My answers to these questions is simple, Iraq needs a complete reconstruction starting from underground with sewage systems, to street paving, to building bridges, hospitals, and entire cities. There is a lot of interest, on the part of many different companies, to explore the new market after the political climate settles down and the war on ISIS ends. And most importantly, Iraq has the resources to pay for it all. Iraq has the potential be the next Dubai. But what is stopping Iraq from becoming the next Dubai? The answer to that is simple – the holy trinity! Unfortunately, Iraq’s business market is run by powerful groups and elites, political parties who control government institutions. It’s not a monopoly, it is oligopsony. After the collapse of the Roman Empire, a hierarchical feudal order emerged in Europe with kings, lords, and peasants. Just like that 2000 years later, after the collapse of Saddam’s regime, a hierarchical order emerged in Iraq with a few political parties, bureaucrats, and modern day sherpas. Those political parties control the government and dedicated to building personal wealth, bureaucrats acting like bandits, and sherpas do the daily work. I cannot explicitly use names of companies, but I can share the pattern of how doing business in Iraq is done. For example, XYZ Corporation wants to open a business. XYZ seeks or knows someone in Iraq. This Iraqi person is related to someone who is influential. This influential person can collude/bribe with an official or member of a political party to bless all the paperwork through the bureaucratic channels. These Iraqi bureaucrats would sign, stamp, and shuffle the documents faster than calling back their wives – when, that is, they get a call from a political party member. This official would bring protection against harassment from different sides too, and would probably offer militia protection at a discount. Someone might ask: how do these companies bribe these officials? Well, very simple. This eponymous official has a close family member who acts as a consultant. This consultant signs the legal documents to obtain fees for his consulting services, provides account numbers for his off-shore accounts. As contracts get signed, money gets wired to those accounts – the holy trinity at its best! I provided the recipe of why nations like Iraq and others fail. There is no need for economic theories or open-market laws in a country where the laws of AK-47 and militia rules. Only those who Nassim Taleb refers to as “Intellectual Yet Idiots” who he describes as Ivy League educated yet “cannot find a coconut on a coconut island” would infer otherwise. This oligopsony with its holy trinity is the single obstacle to economic growth. These people stand against the economic progress, which leads to unemployment and makes many people susceptible to be exploited by terrorist’s organizations. If you are a major business and would like to invest in Iraq, it would be extremely difficult without the blessing of the holy trinity. Without it…I say good luck! As for Iraq, it shouldn’t require the rise of a benevolent dictator to strike down this holy trinity with sledgehammer on an anvil to forge a brighter future and make Iraq the next Dubai. *Bribe: It’s an interesting concept. It has a different meaning to different people such as consulting fees. Since the Creation (if you believe in the Bible) where the Serpent bribed Eve with an apple (eating a fruit), to Jared Kusher’s personal touch in weapons sale to Saudis, humankind has been bribing each other. It will not stop. And with $110 Billion, a lot of people believe you can even bribe god this time. Qatar will be the 25th country I will visit. “In the next few hours, my life will change,” I told my friend on the phone. It was time to return to Chicago, to the real world. It has been six months and five days since the last time I was in America. I had an 18-hour layover in Qatar. After all these months in Iraq, I deserve any luxury that comes my way. My journey home had started. After a two hour flight from Baghdad, I landed in Qatar. I’ve never seen such an impressive airport. It is a source of national pride for Qataris. I started asking him all kinds of questions about Qatar. And he answered, giving me his perspective as an American expat. Apparently, he enjoys working there. One of the odd things he mentioned was that Qatar treats teachers very well. He knows of an American couple that teaches English in one of the Universities. They get paid well and have an impressive apartment as part of their package. We drove to Souq Waqif – which means “standing market” – to have some lunch. There are numerous shops selling souvenirs, traditional garments, handicrafts, and a few shisha lounges. 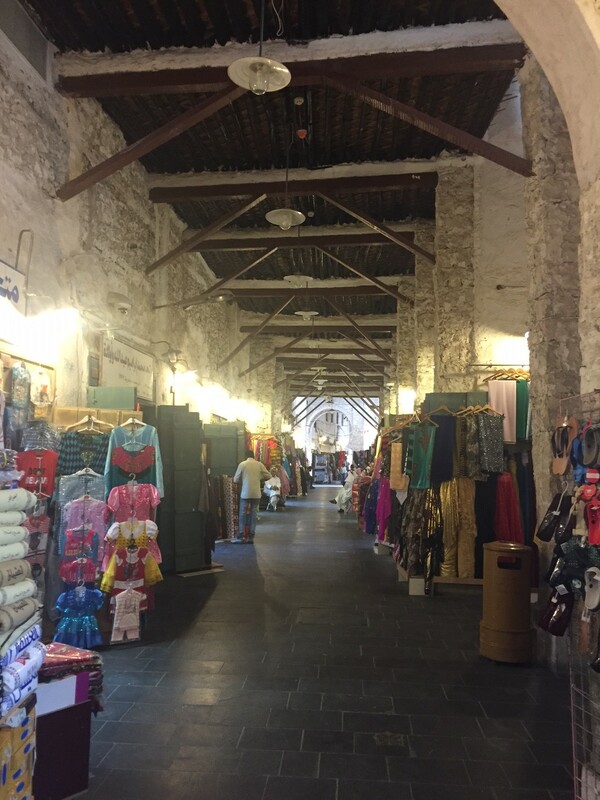 The Souq is one of the last remaining authentic features in Doha. The area is popular with locals, tourists, and expats alike. The novelty of this scene that we are two Americans having lunch at an Iranian restaurant, together with other Iranians, being served by a Filipino waiter in an Arabic country. It’s a true mix of cultures, eating and working together during a time when President Trump is raising political tension with Iran. It all makes for a very charming picture now. But if war broke out between Iran and America, I wouldn’t want to bet on peaceful co-existence continuing, between the Iranian and American ex-pats living in Qatar. I told Abdul Latif, Qatar has a relatively negative reputation in Iraq. Most Shi’a Iraqis believe that Qatar is one of the countries that is financing ISIS activities in Iraq. “What is your take on that?” I asked. After lunch, we went on a tour of the city, which appears to be under construction in preparation for hosting the FIFA 2022 World Cup. We passed by the soccer stadium that will showcase opening night – very impressive. Then we visited the Villaggio Mall with its VIP public bathrooms. As we parked, some Indian (or maybe they were Palistani, a prime example of a country’s inequality/class) car wash workers came and offered to wash our car. It was an interesting concept – an extra add-on to the shopping experience. Wealthy Qataris probably never wash their cars themselves. 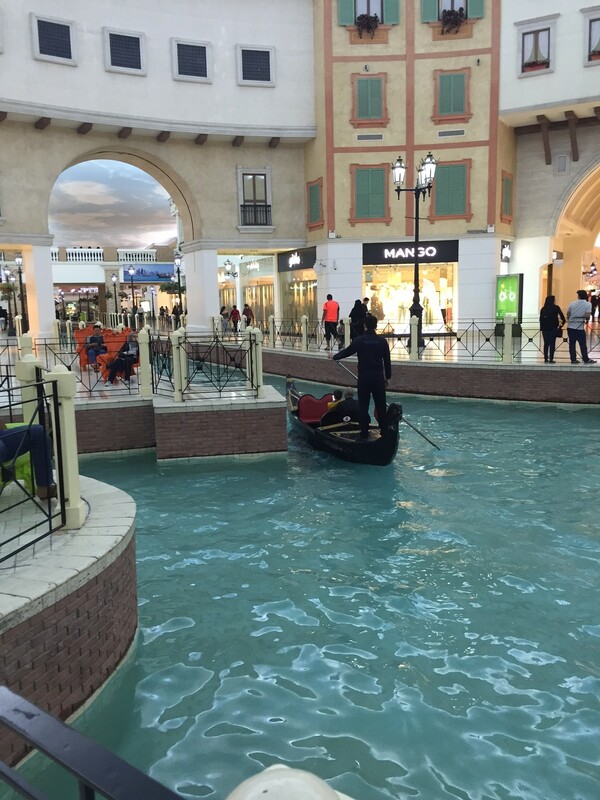 As for the mall, with its canals and gondolas, it emulated the city of Venice. It was evening by the time we left the mall. 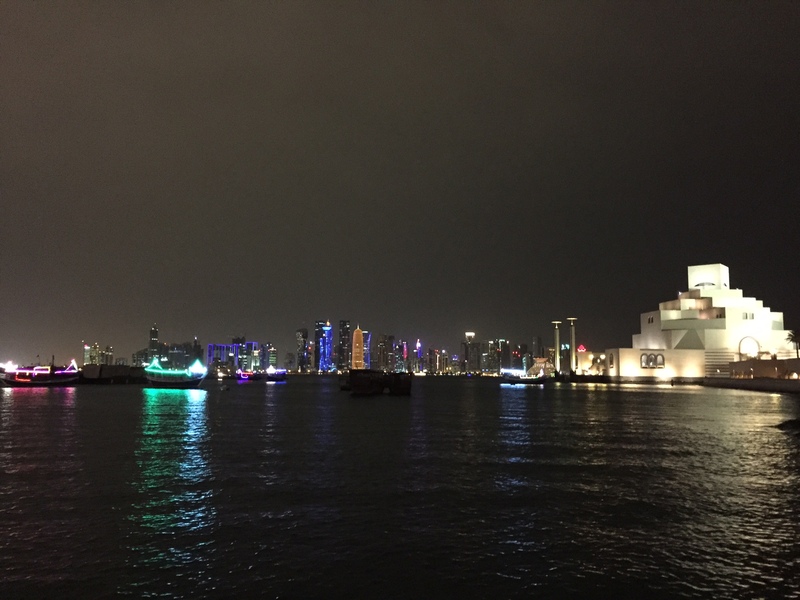 It was time to go check the Qatar Corniche with its nice panoramic view of the skyline. It was Thursday night, the start of Qatar’s weekend. Many people enjoy promenading on the corniche. I said people, but in reality, it was 95% males walking around. Just walking and probably drinking Coca Cola. I guess, in this part of the world, that’s part of an ultimate weekend. Abdul Latif pointed to the buildings of Qatar’s skyline and said, “the majority of these high-rises are empty.” I guess he was inferring that there is a real estate “bubble”. I asked him if there is any other place to see before I leave. “Not really”, he replied. 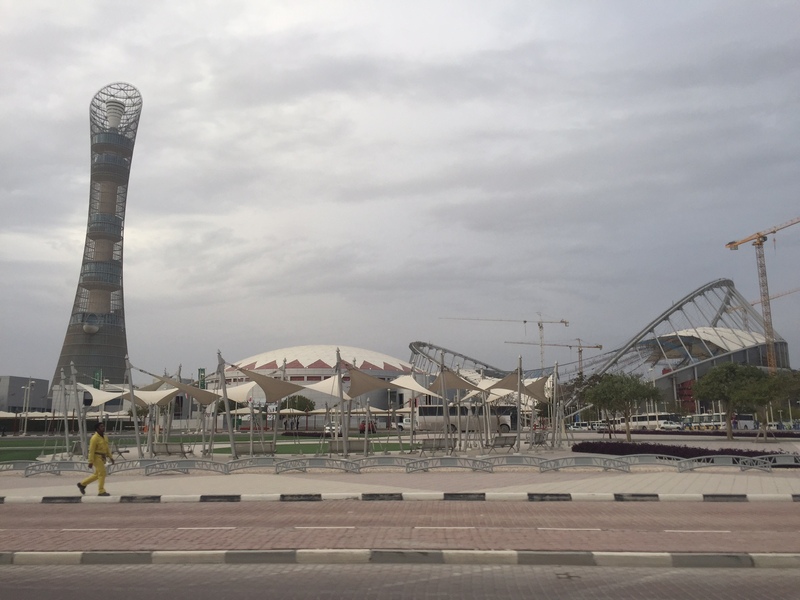 Apparently, one can tour Qatar in less than 24 hours. We then drove to the DoubleTree hotel by Doha’s Old Town. I noticed posters of Sheikh Tamim bin Hamad Al Thani and his father in many of the buildings and hotels in the capital. The son took over the kingdom from his father after a bloodless coup d’etat. I actually thought it was both ironic and funny. But wait, I started to see a parallel with American politics. It was first George “H” Bush and then we had to deal with “W” (on the Republican side). For the Democrats, it almost became the husband and wife show of the Clintons. As for the Trumps, I don’t know what to make of this just yet, but it seems that he is preparing his daughter for the Presidency. It looks like an Arab style nepotistic power grab. When I arrived at the hotel, I found out that there was a nightclub and to my surprise, they served alcohol and because I heard music, probably allowed dancing. I wondered if, like in some other Arab countries, there would be signs that said “No Man to Man Dancing”. I wasn’t able to satisfy my curiosity because I couldn’t get in the club. They had a strict dress code and I didn’t have my dress shoes with me. I found the entire thing to be shocking – tantamount to finding a nightclub inside a prison in Venezuela. “Yes sir, the car is waiting for you.” He replied. The van “shuttle” I was expecting turned out to be a 2016 Audi A8. I guess in rich countries like Qatar, words like “shuttle” are not exactly lost in translation, but take on a different meaning. Later, when I reached the C10 gate, Qatar Airway’s Boing 777-300ER was waiting to fly me home. As my flight was taking off, I realized that my pre-conceived notions of Qatar still needed more thought, because as we all know processes and politics in the Middle East are complicated, to say the least.